Set up relationships for individual records to track family, legal relationships (such as power of attorney), and more. Creating relationships for individuals is important if you want to track persons related to your clients and prospects, such as spouse and dependents, in policy enrollments and elections. Learn how to add relationships in this article. Go to an individual record, then open the Relationships tab and select 'Add'. Specify the related individual and enter relationships details. If you select the ‘Enter Text (Basic info)’ option, you will create a “basic” individual. Basic individuals track a limited amount of information, and they are not included in AgencyBloc’s Automated Workflow, Email Marketing, or reporting features. Basic individuals are commonly used to track a client’s spouse and dependents, such as children. Add a corresponding relationship (optional). For more information, see the Setting a corresponding relationship section of this article. 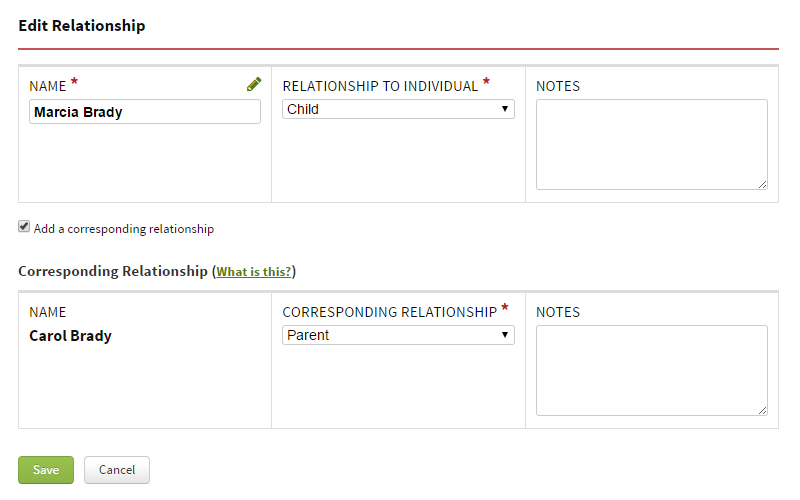 The relationship will appear in Relationships tab and Individual Summary. A solid block means the related person is a full individual. An empty block means the related person is a basic individual in AgencyBloc. Relationships can change over time. If you want to update an individual’s relationships, simply follow the steps above. Note: If the individual has corresponding relationships, make sure to update those relationships on the related individuals as well. For more information, contact our Client Success Team and check out the Data Import Overview article. When you add a relationship to an individual, the relationship will only be added to that individual. If you want a relationship to be reflected on the other individual, use the corresponding relationship option. Note: The corresponding relationship option is only available when you are first adding a relationship to an individual or creating a copy of any individual. For example, let’s say we are looking Carol Brady’s record and you want to add a relationship for her child, Marcia, so you can track when Marcia turns 26 and falls off of her parent’s insurance. As you’re adding a relationship to Carol’s record, you can add a corresponding relationship to Marcia’s record. With the corresponding relationship, you create a relationship on Marcia’s record to show that Carol is her parent. Note: If the relationships in your account appear to be flip-flopped, see the Merging Relationships section of the Managing Individual Relationships article to help you straighten things out. Before you start, let us know and we can walk you through the process. Can I add a relationship without having to create a record in my account? Yep! To add basic individual info while creating a relationship, select the pencil icon and then enter text. Can I search for individuals that I just enter as text? Good question. You'll see individuals entered as text on the Individual Relationships Report. They won't show up in individual search results or on other individual reports. How do I move dependent data from custom fields to add them as a relationship? For this scenario, there are a couple of steps. When you have a large set of data, you'll need to run an individual report including the custom fields of the dependent data. Then, we can provide an import template for you to complete and then we'll import it for you to get the relationship data into your account. Contact our Client Success Team for more info. I have a large number of relationships I'd like to add to a large set of individuals. Can you help? Contact our Client Success Team for assistance. They will send you a relationship import template. Fill in the missing blanks and send the completed template back to them, and they’ll run the import for you..